Recognizing an outstanding professional for longstanding dedication, expertise, and contributions to the field of child abuse and neglect, this award was presented to George W. Holden (center) by Councilors Lucia Williams (right) and Sue Foley (second from right), along with ISPCAN Executive Director Pragathi Tummala, President Elect Tufail Muhammad, and President Bernard Gerbaka. Dr. Holden is chair of the Psychology Department, Southern Methodist University, in Dallas, Texas. Nominator Sue Foley said that Dr. Holden has, “over a period of almost 40 years, dedicated his life as a psychologist, research, and advocate to understanding and preventing child abuse.” He has published significant books and articles on numerous topics, and developed a new construct and instrument on “meta-parenting” to study parents’ reflections on their own parenting. Dr. Holden is also founder of the U.S. Alliance to End the Hitting of Children, and “his applied and concrete efforts to ban corporal punishment in the world, particularly in the U.S., are an inspiration to us all,” said Foley. 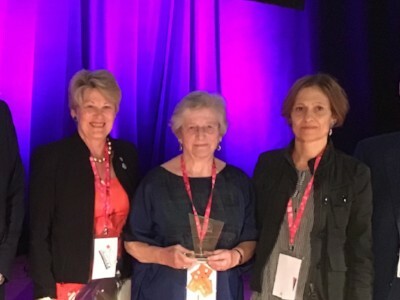 This award, which recognizes an individual for his or her commitment and dedication to ISPCAN, was presented to Danya Glaser (center) by Councilors Jenny Gray (Past President), left, and Victoria Lidchi, right. Dr. Glaser was ISPCAN President from 2006–2008, and showed great leadership through many organizational changes as well as leading ISPCAN’s involvement in the United Nations CRC General Comment 13: The Right of the Child to Freedom from All Forms of Violence. She has continued to support the organization since her term ended, including as a regular attendee and chair at ISPCAN congresses and conferences. She chaired a plenary at the European Regional Conference in the Hague, and is leading for ISPCAN on the development of Guidelines on Fabricated or Induced Illness. In her distinguished career, Dr. Glaser has been a pioneer in identifying and treating child sexual abuse, emotional abuse, fabricated or induced illness/Munchausen Syndrome by Proxy, and the effects of maltreatment on brain development. She is currently a visiting professor at University College London and an honorary consultant in child and adolescent psychiatry at Great Ormond Street Hospital in London. 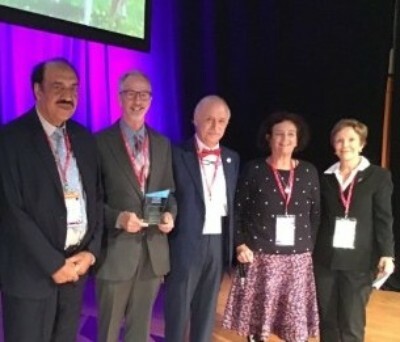 This award, given to Margaret Lynch (second from right) by ISPCAN President Bernard Gerbaka (right), recognizes lifetime contribution to the field of child abuse and neglect and to children’s rights. Dr. Margaret Lynch is emeritus professor of Community Paediatrics at King’s College, London, and was previously a clinical and academic social and developmental pediatrician working within the UK National Health Service. Her research and much of her teaching (over 35 years) focused on child protection and children living in difficult circumstances. Margaret attended the first international meeting convened by Henry Kempe in Bellagio in 1975 and is a founding member and past president of ISPCAN (1986–1988). She was a member of the International Working Group on Child Labour set up in 1992 by ISPCAN and Defence for Children International. She has undertaken consultancy work for WHO, UNICEF, Save the Children, and the Oak Foundation, and has participated in child protection activities in over 40 countries. 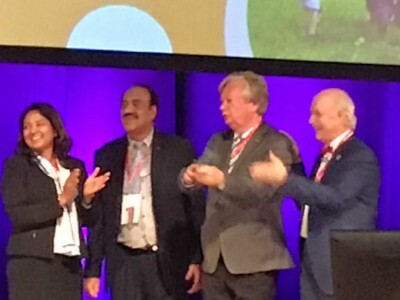 The Presidential Award, recognizing contribution to the field of child abuse and neglect and children’s rights, was also given to Jaap E. Doek (second from right) by ISPCAN President Bernard Gerbaka. Jaap Doek is emeritus professor of law (family and juvenile law) at the Vrije Universiteit in Amsterdam and a founding member and past president of ISPCAN. An ISPCAN Councilor for 16 years, Professor Doek was also involved in the creation of Defence for Children International (DCI) and established the Dutch Section of this organization. He was a member of an ISPCAN/DCI working group on child labor and the board of the International Association of Juvenile and Family Court Magistrates (1982–1986). He has been a member of the UN Committee on the Rights of the Child, including as chairperson from 2001-2007. In his legal career, he has served as dean of the law faculty at Vrije University, professional of juvenile law at Leiden University, deputy justice in the Court of Appeal of Amsterdam, and a juvenile court judge in the district court of Alkmaar and the Hague. 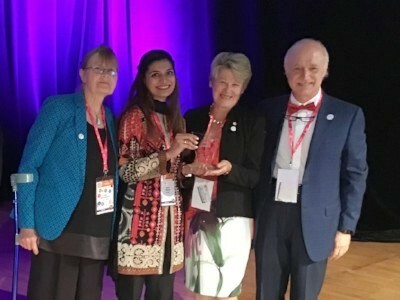 Recognizing an outstanding young professional working in the field of child abuse and neglect, this award was presented to Mehek Naeem of Pakistan (second from left) by Councilors and Past Presidents Joan van Niekerk and Jenny Gray, with President Bernard Gerbaka. 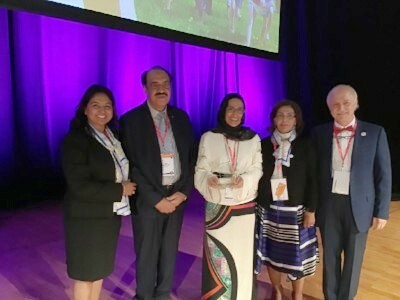 Founded by Dr. Mona Alkhawari (center), the Supreme National Committee for Child Protection (SNCCP) received this award for exceptional work of a multidisciplinary team that has made substantial progress in the treatment or prevention of child abuse and neglect in its local community. 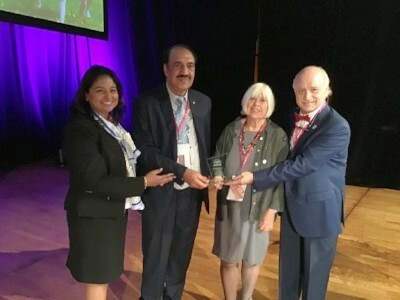 The award was presented to Dr. Alkhawari by ISPCAN Councilor Maha Al Muneef (second from right), with ISPCAN Executive Director Pragathi Tummala, President Elect Tufail Muhammad, and President Bernard Gerbaka. Established in 2013, SNCCP is a forum that brings together all sectors and agencies concerning child protection, including governmental and non-governmental sectors. Dr. AlKhawari is the Director of the Child Protection office in the Ministry of Health and serves as Vice President of SNCPP. 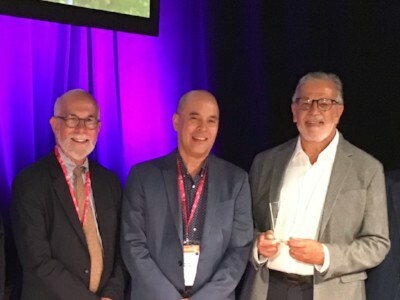 Recognizing an individual who has made significant contributions to the welfare of children and demonstrated significant teaching experience, this award was presented to Dr. Howard Dubowitz (right) by ISPCAN Councilor Martin Finkel (left) and ISPCAN member Dr. Gabriel Otterman (center). Dr. Dubowitz needs no introduction at ISPCAN. A former two-term Councilor, pediatrician, and prolific researcher and lecturer, his work and writings have conceptualized and defined the “neglect” component of child abuse and neglect (CAN). For decades, he has been a vocal champion of a shift toward supportive rather than punitive interventions in addressing the complexities of CAN, making a tremendous impact on the health and welfare of children both in the U.S. and throughout the world. Nominator Gabriel Otterman said Dr. Dubowitz is “an endearing and treasured mentor, colleague and friend who represents the very best of what it means to be a child abuse pediatrician, public health practitioner and leader.” He has been a professor of pediatrics at the University of Maryland for 34 years as well as founder and director of the Child Protection Team, Division of Child Protection, Care Clinic, and the Maryland Child Abuse Medical Professional Program. He has continued to support ISPCAN as editor of World Perspectives on Child Abuse. Winners were publicly recognized Sept 2-5 at the ISPCAN XII International Congress in Prague.